Construction is set to being Monday, June 18. 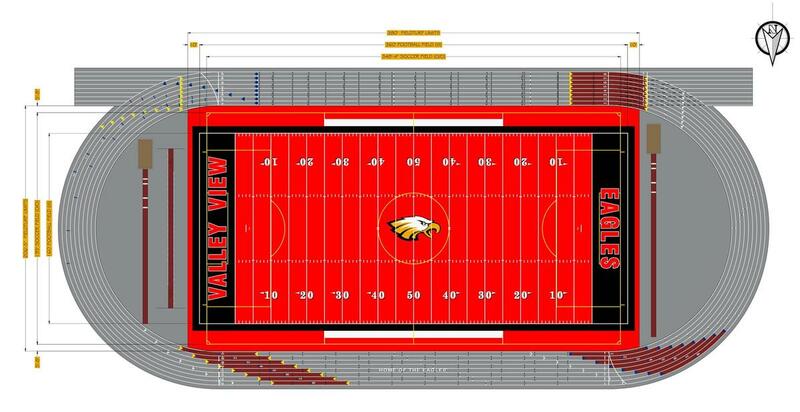 Valley View High School’s football field and track is getting a big facelift beginning next week -- and it’s of the color RED. The Valley View artificial track and field project is being done to improve surface safety and performance, reduce maintenance expenses and reduce water consumption. Additionally, the project, which includes red turf installation, will enhance school pride and culture for students and staff, as well as providing improved resources for the community. The scope of work includes demolishing the existing track and field, providing significant drainage and grading improvements, providing an irrigation system to wash and cool the field, installing premium grade artificial track and field surfaces, including all event in ground equipment and perimeter fencing/gates as needed. Construction is set to being Monday, June 18. The track and field will have an 8 and 10 year warranty respectively, and will serve the school and community for many years to come. "This is a project that lets people know that Valley View and Moreno Valley Unified are serious about their athletic programs and developing our players' skills," said Cleveland Johnson, Board of Education Clerk. 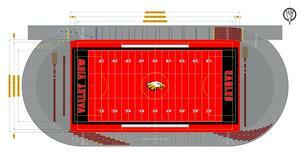 "I believe the bright red turf is going to attract new visitors to our school's football games and track events, so our students and community are in for a real treat."